Text and photos by Daniel Tubío. 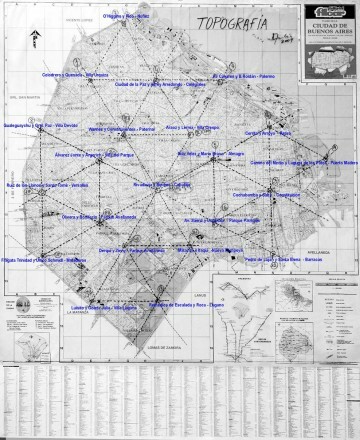 This series consists of a work on Buenos Aires city, which was conceived and carried out during 2003/2004. The whole work included designing and building the pinhole camera for the creation of these photographies, and with them I try to reflect about some aspects of the way we relate ourselves with urban spaces, specially about all those itineraries in which chance –or protocolar decision, as it was the case– breaks monotony and leads us to areas which we perceive as strange territories, even when they are not so distant from the places where our day-to-day life belongs. One route, any corner… a quotidian spot (a commonplace) for some of the city inhabitants, an unknown world for some others. This work also means a reflection about the photographic medium and the available possibilities in pinhole technics, as when we build up our own tools, one advantage is that cameras have no secrets for the builder and setting them up is directly conected with the type of images we are trying to obtain. This photographic adventure began some time before the actual materialization of the series, by means of a present from a friend that turned into a challenge: she gave me a triangular tin and told me: “I’m sure you are going to do something good with it”. Since then, trying not to dissapoint her, I started thinking what kind of camera could I build with that container and what kind of photographic series should I create from it. It came gradually to my mind the idea -obviously an arbitrary idea– that a triangular camera should only be used to shoot corners. 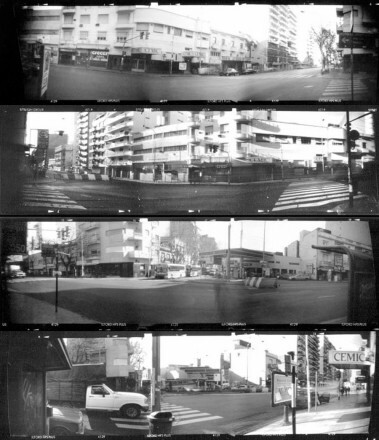 To complete this notion and make it more consistent with the urban modern development concepts, I designed a chamfer-shaped negative mounting to support a film strip –an inverted chamfer corner, because its goal is obtaining a negative, an inversed view in relation to the so-called “reality”. Once the camera was finished, I went through two processes which usually appear simoultaneusly in all my series: searching for optimal technical parameters based upon the kind of pictures I wanted to obtain, on one hand, –this search is described at the end of this text-, and on the other hand, taking conceptual decisions about the images: which specific corners should I shoot, where should I take the photos, and the reason of the choice itself. So, while tunning the camera, I began to think about some basis to select the corners. The general location was solved in advance, as one of the recurring topics in my work is my hometown Buenos Aires, a city I really love. It is big enough to display a surpassing cultural life, and gentle enough to house neighborhoods —as “Saavedra” my own neighborhood— where people takes their chairs out to the sidewalks in summer evening and sit to share some “mate”1. From the very beginning I rejected the idea of looking for “traditional” corners, famous spots or any kind of tourist cliché. And suddenly, by linking schemes, the answer appeared. What was interesting about it is the fact that the clue was “suggested” by the camera itself, specifically by its shape: being a triangle, it reminded me those movies where detectives and cops map out triangles just to locate areas where the suspicious guys would eventually make their moves, and then, inmediatly, my modus operandi came clear to my mind: to delineate triangles on a Buenos Aires map by copying the camera shape, and then, allow chance (random ensuing from the method itself) decide which corners should be shot. So I bought the biggest available city map and embarked myself upon the task. My first dilemma was about the initial point in order to design the triangulation protocol. I decided it should be at Av. Rivadavia & Biedma St. crossing, because it is the location where it used to be the clinic where I was born. Now, at the same place, there is a high complexity medical institute. I could justify my choice arguing that this corner is only some 700 meters from the geographical city center, but this choice is in fact as arbitrary as any other else, and it proposes a subjective departing point for a later development which just kids about those typical “objectivity” claims of the photographic medium. Once found the initial corner at the center of the city, the rest was just a systematic work: I placed one of the triangle camera vertex on that corner and mapped out a northwards triangle. Then, I repeated the proceedment by resetting the camera on each obtained vertex until touching the city limits. This operation was repeated three more times: eastwards, westwards and southwards. This way, the city map ended up covered by triangles with 22 marked intersections, which turned out to be the sites I should shot during my work. All these triangles created a net on the map, and this net coincided with one of the possible routes between the corners. But this itinerary was in fact unapproachable in the actual space of the city, except for urban explorers2), as it crosses blocks diagonally and does not obbeys to transit defined spaces. After solving camera technical aspects and defining routes, the rest was just to take the photos. I decided that each shot should be made with the camera in the same position, it is: set parallel in relation to the ground, at a height equivalent to that of my eyes, which means around 1,65m. from the floor. Once again, subjectivity apears here applied to the work. A previous investigation about the routes was made, as I had to obbey not my web on the map but the usual roads and streets in the city. This investigation was aimed to find the proper way of reaching each one of those assigned places by means of public transport, and I also made an informal inquiry among my friends and close people about features of those neighborhoods which were unknown to me, to prevent eventual security, access or circulation problems, on one hand, and to plan which day in the week or which time in the day would be more accurate to accomplish my expedition on the other hand. All this research was carefully put into paper and it is summarized in four A4 sheets, which turned to be the “roadmaps” I used for the task. These documents show selected corners and the way to reach them, references about the different areas (only in those cases I managed to get references before going there), dates and times when the shots were taken and additional observations about pre and post-production of the work. We should bear in mind that due to the camera technical parameters, only one shot was possible at a time, so it was necessary to make an accurate plan in order to take profit of each trip. Let’s say that Buenos Aires is so big that sometimes it can take almost two hours to cross it from one limit to the other. I took four photos at the starting intersection, facing the camera towards a different cardinal point each time, in order to register the whole surrounding space and to “echo” the gesture I had accomplished on the map: a circling movement towards the four cardinal points. As for the rest of the registered corners, the view was choosen by me among the possible ones –usually there were four possibilites, but some streets intersections in the city are formed by 3 or 5 corners. Once again, at this point, “subjectivity” was the leading idea. 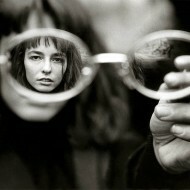 There were 25 final photographies, shot approximately in the term of two and a half months (may/july, 2004). Only once it was necessary to return to the corner to take back an incorrectly exposed shot; for the rest of the images, only one trip was enough. 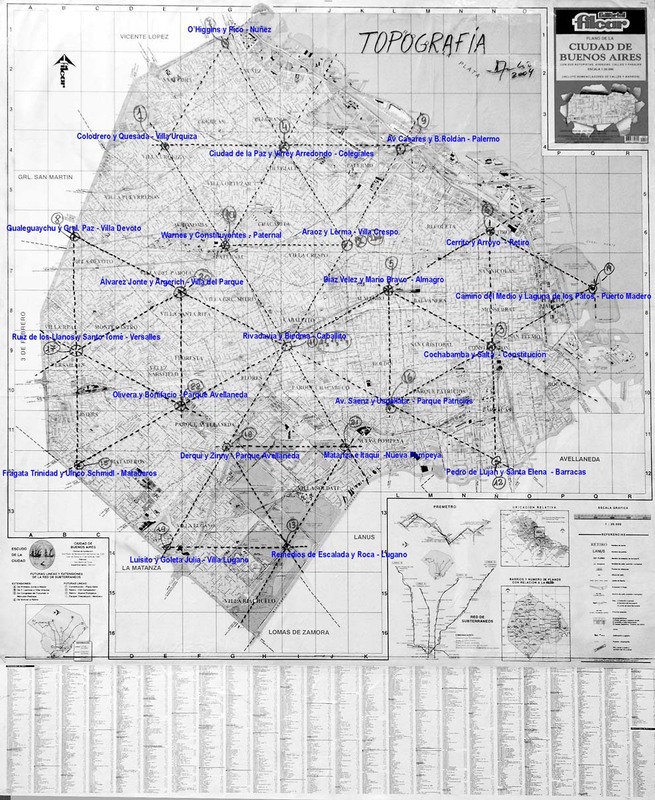 The complete series comprises not only 25 images of the 22 street crossings, but it incorporates the original map were the triangulated web was designed (1,25mts x 1 mt) and the “route maps” used for the work as well. The whole photographic series was showed for the first time in August, 2004, at the Museo Histórico Saavedra (Saavedra History Museum) in Buenos Aires City, and then, in 2007, it was exhibited again at the Palermo University Photogallery (may) and at the Architecture Faculty Exhibitions Rooms in the University of Buenos Aires (november). 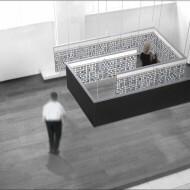 There were different audiences in each of the three exhibitions, as they came from widely different backgrounds and that meant a variation in individual profiles. However, one of the most interesting aspects regarding public reaction was the fact that people came to me to express similar concerns. On one side, they showed themselves surprised to see in the photos some places they could hardly recognize as belonging to the City, as it is the case of the photo taken in Castañares St. & Goleta Julia St.
On the other hand, in an opposite direction, everybody discovered some places that were well-known for them, because locations were close to their homes or to their jobs. Some of them, indeed, found an image (surprise!) of their own homes in the photos. This made me think that this series, which had began as a challenging game, had somehow turned into an interesting and peculiar documental land registry -even being partial and limited- and it was working well regarding one of the most relevant aspects still valid in a photographic image: its relationship with the referent, its “documentary” status and the audience interpretacion -better, the audience assumption– of photography medium as a reflection of their own experiences. The inverted chamfer shape of the film inside the camera was supposed to be an interesting technical challenge. 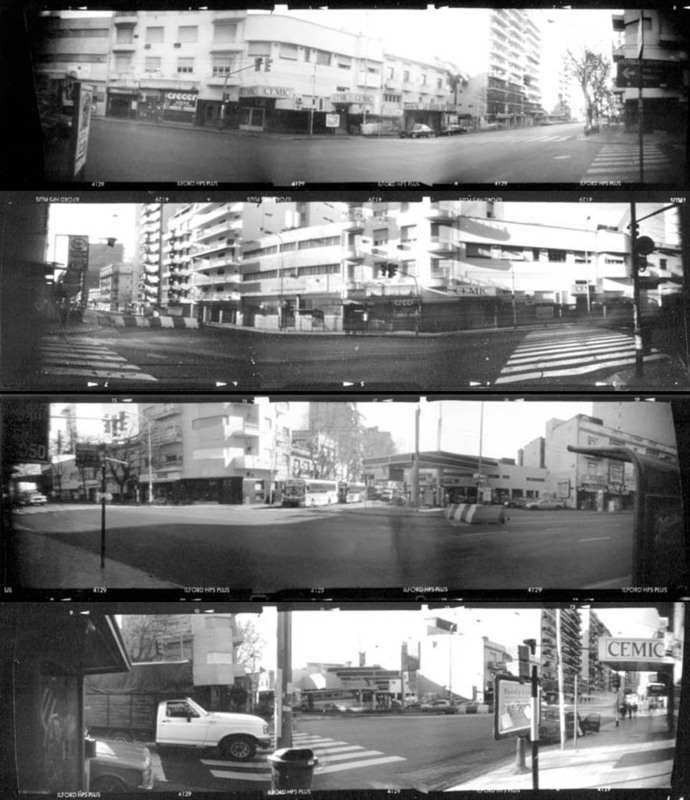 Film setting plus distance from the pinhole to the imaging plane in the camera generates an angle of view of around 160º, which makes it possible, if standing on one of the streets crossings, to include the other three corners in the same image. But this shape brings rigged several problems to solve. 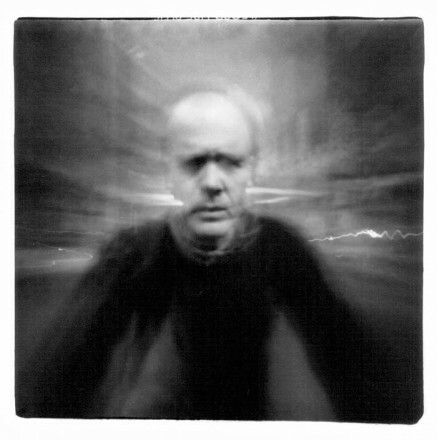 Light breaking through the pinhole travels along dissimilar distances to reach different areas throughout the film, which has a size of more or less 6x22cms. Because of this, it was necessary to find out an average among all these distances in order to calculate the appropiate pinhole to obtain an optimized sharpness. I arrived to the conclusion that best pinhole diameter was 0,25mm, which provides the camera with a 360 f number. This size of apertures needs quite long exposure times, and here I run into another problem: long exposure times combined with a chamfer shaped negative –where the film reflects some light onto its others own surface areas– produced low contrast negatives. I started to test different films, exposures and developers until finding the ideal combination: Ilford HP5 plus 120 roll-film, ISO 400, pushed up to ISO 1600 and developed with D76 stock in 11½ minutes at 22ºC. It took me around six months to test camera and film until I reached to the results I was looking for. Final prints were copied by me on FB black & white paper by means of an AGFA Repromaster 1300 used as negatives enlarger. The Repromaster is a reproduction camera which makes it possible to enlarge or reduce transparent or opaque originals. Some years ago it used to be an essential device in graphic industries, but today it has turned into another example of technological garbage due to the outcoming of digital printing systems. Increible lo logrado en esta serie de fotos, felicitaciones! Increibles proyecto y fotos, y un increible maestro de la fotografia! Saludos Daniel, gracias por tanto! Excelente trabajo. Un placer recorrer estas imagenes y sus contenidos. Felicitaciones Daniel! No se que mas decirte porque las palabras quedan super chicas para un genio como vos, en serio, es excelente como haces magia de la fotografia. a mi todavía me cuesta entender a la fotografía estenopéica.. pero me encanta! exelente trabajo y exelente docente!! un placer conocer gente apasionada como vos. Más allá de las fotografías, se percibe que sos una gran persona y eso es lo importante; entre millones y millones de imagnes que circulan se puede decir que lo tuyo no son imagenes sino un trabajo y eso, hoy por hoy, ya no se ve. Felicitaciones!! aló tubio, tanto tiempo usted siempre sorprendiendo, con su ojo atento y distinto, nos alegra poder ver su mirada sencilla con una tecnologia tan simple, espero siempre que nos crucemos en esas esquinas que muestra tu obra o en algún camino patagónico. un abrazo enorme, para vos y para alicia, cariños de pia y un abrazo. guillermo ramírez, un poco de uruguay en la patagonia argentina.